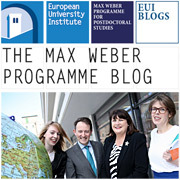 Although I have been in post as Director for less than a month, it has been sufficient to appreciate the vibrancy and enthusiasm of all those involved in the Max Weber Programme, from the administrative team to the postdoctoral Fellows themselves. At the start of the academic year the MWP moved from the Villa La Fonte, where it had been located for its first seven years under the Directorship of Ramon Marimon, to the Badia. It is a pleasure to be able to pay tribute here to his and the team’s remarkable achievement in establishing the Programme and making it the foremost postdoctoral programme in the historical and social sciences in Europe. The aim of the next five years is to build on this considerable legacy and to develop further both the place of the Programme within the activities of the EUI as a whole, and its global standing within the academic community. With regard to the first aim, the move to the Badia places the MWP both symbolically and substantively at the heart of the EUI. As a multidisciplinary programme it brings together many strands of research that cross not just the four departments but also the Robert Schuman Centre. To a degree the Max Weber Lectures already provide a focal point for building academic community and dialogue across the EUI as a whole. Two new developments seek to extend the integrative role played by the MWP in the academic life of the EUI: the incorporation of the Jean Monnet Fellows postdoctoral Fellows within the MWP, and the creation of thematic groups. As of 2015, there will no longer be any Jean Monnet postdoctoral Fellows. JMFs will be reserved to those who have undertaken more than 5 years of postdoctoral research. Instead, the number of MWP Fellowships will be expanded to include those that were previously funded from research projects undertaken within the RSC, and they will be selected from within the same applicant pool. There was already a significant overlap between those applying for JM and MW Fellowships, and this change in part normalises that situation. However, it also creates a bridge between the departments and the RSCAS and among the Fellows as a whole. This bridging operation is enhanced further by the creation of thematic groups. These themes have been chosen inductively by grouping together Fellows with similar research interests who have been selected according to the standard criteria of academic excellence, cogency and originality of the proposed research and fit with the profile and mentoring capacity of academic staff at the EUI. As such the themes are likely to change to some degree from year to year, although some continuity is likely given the overall research profile of the EUI. The goal is for these groups to be led by at least two Professors from different disciplines and to provide a forum for discussing research in progress. The second aim is on-going work in progress. It has become clear that there is great interest in the MWP not only from the EU and Member States but from across the world. The MWP has established a well-merited niche as the only coherent and coordinated programme at the postdoctoral level within the historical and social sciences. As such, there are many countries willing to fund postdoctoral fellowships in addition to the funds already provided by the EU for this purpose. It is hoped that as a result we shall be able to both increase the number and extend the length of fellowships. This will allow for greater flexibility in delivering the Programme, which is currently very compressed, and to enhance the possibilities for Fellows to get teaching experience both in Florence and with our partner universities. I look forward to reporting on progress on both these major developments in future newsletters. When, in September 2012, we arrived in the magical surroundings of Villa la Fonte for the start of our Max Weber Fellowship, we were all encouraged to exploit a unique feature of the Programme: its multidisciplinary character. The then Programme director, Ramon Marimon, invited all of us to reach out, engage and collaborate with colleagues from across the university’s four departments of economics, history, law, and social and political science. With this spirit in mind, Philip Balsiger, a social movement theorist, David Pretel, an economic historian, and myself, an international relations scholar, got together with a number of other Fellows to form a Historical Sociology reading group. The scope of the group, in the year 2012-2013, was to read work that bridged the history/social science boundaries, a theme that a number of us were not only very interested in, but also believed was very much in the Weberian spirit of the Fellowship we were embarking on. We read major texts by leading scholars in the field, such as Charles Tilly, Giovanni Arrighi, Jacques Revel, Michael Mann, and David Mandler, as well as newer ones by Ivan Ermakoff, George Steinmetz, Daron Acemoglu and James Robinson. Many of the ponderous readings and intense debates were lightened up by the venue and time of our meetings, during dinner and over plentiful Tuscan red wine. The reading group moved into its second year. As new Fellows arrived at the Badia, where the Max Weber Programme had migrated in the meantime, so the reading group evolved under the input of Hassan Malik, a historian of international finance and globalization. In 2013-2014 we concentrated on the history and theory of revolutions. The dinners and wine continued, but this time round discussions ranging from the natural historians’ approach to revolutions, such as that of Crane Brinton, to the structural account of Theda Skocpol, to more recent work on revolutions from a history of emotions perspective. To what extent the multiple historical cases and diverse theoretical perspectives we encountered helped explain events unfolding in the Middle East – the so-called Arab Spring –, was of concern to many of us. The two years of the reading group finished on a high note, with a seminar led by Theda Skocpol. The seminar, organized mostly for postdoctoral Fellows and PhD researchers, was structured around a discussion of Skocpol’s recent book on the Tea Party, with a retrospective on the evolution of her scholarship since the 1979 classic States and Social Revolutions. The conversation also took a more personal and intimate direction as Skocpol reflected upon her career as an academic, the obstacles and discriminations she faced as Harvard’s first tenured female sociologist, and what has led her to become, over the decades, an increasingly publicly engaged scholar. All along, I like to think that Max Weber himself looked upon the reading group and its activities from the heavens with interest and curiosity. Surely this has been a cherished experience for many of us. Most importantly because it created a space for genuine intellectual exchange and exploration, at a time when forces all around are sadly pushing young scholars to become overwhelmingly utility-maximizing, hyper-professionalized, grant-scavenging, strategic-oriented academic automatons. 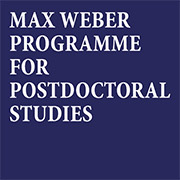 I was absolutely thrilled when I received the news that I had been offered a one-year Max Weber Fellowship, starting in September 2007. The prospect of going to beautiful Florence, meeting Professors from the SPS Department at the EUI, and simply having one year to focus on my research was just wonderful. I remember well, however, that I was a little puzzled when I was sent more details about the programme. In the run-up to September, I had to prepare an Academic File, complete a self-evaluation and learned that I would have to participate in quite a few activities, coming by such names as Academic Practice Working Groups, Multi-Disciplinary Workshops and Teaching Development Seminars. I should add that at the time when I started my life as a MWF, I had been a Lecturer at the University of Nottingham for three years. Unlike most of my fellow Fellows I would not be on the job market but would return to my job. Quite naturally, I was hoping to have time for research after I had spent plenty of time preparing lectures and teaching seminars (during and) after the completion of my PhD. Yet, there is no doubt, the year as a MWF turned out to be an excellent experience and one of the best years of my academic life. I met a lot of new people, some of whom became friends and collaborators. Despite initial worries, I had quite a lot of time to start a new research project. Indeed, much of the work that I am doing today had its origin during that year as a Max Weber Fellow. And the many MWP activities turned out to have an impact well beyond me revising the format of my academic CV and trying to figure out how historians, economists and legal scholars tick. One of the main outcomes of the year as a MWF has been the re-organisation of the PhD programme of the School of Politics & IR in Nottingham. In 2011, I became Director of Postgraduate Research and was given the task to further develop our PhD programme. The MWP activities, the experience of my fellow Fellows and the EUI model have been a major source of inspiration for the PhD programme in Nottingham, which has been in operation for the last few years. By now all our PhD students have to take methods training in the first year of study. Following a Training Needs Assessment, students can pick semester-long modules as well as short, intensive, three-day long modules from the School’s curriculum, the ESRC Doctoral Training Centre that is based at the University of Nottingham, and specialized courses from summer schools at the University of Essex, the ECPR and other methods centres in the UK. In the first semester, students have to further pass what is called the Professional Development module. This is taught by me and it covers issues such as: the changing nature of the PhD in Political Science; how to structure and author a PhD thesis; how to write a journal article, where to send it and how to survive the reviews; how to present at conferences; how to use social media for research and teaching; questions of research ethics; and strategies of time and stress management during the PhD. The activities are complemented by a Colloquium for Postgraduate Researchers, which brings together all PhD students from years one to four. The Colloquium represents a space to meet up and coffee and biscuits are usually served during the sessions. It provides a forum for the presentation of PhD projects and short academic practice workshops that are led by students, guests or myself to cover topics such as: how to prepare for a viva; how to prepare and conduct fieldwork; how to write an academic CV and cover letter; how to prepare for a job interview; and how to get published. During the Colloquium sessions we even experimented with the video-recording of presentations and adapted the MWP evaluation form that is used for the September presentations. At the annual review, we also ask students to submit an Academic File. This is initially discussed during the Professional Development module and then submitted once per year for the annual review. The Academic File is not for assessment but a career development tool, which allows PhD students to monitor their own progress during their four years of PhD studies. Not every student likes to complete the Academic File but it quickly became evident that it is a very useful tool for early year students to raise awareness of the profile of professional scholars. Thanks to these changes, we now have a PhD programme that provides specialized and generic training for PhD students. It prepares them for work as professional political scientists but also provides skills that are highly useful for students who choose to work outside academia. Unsurprisingly, there are always a few students who would wish for fewer commitments during the PhD. They would prefer to do it the ‘old way’, sit at home or in the library and come back after four years with a big book in their hands. But, paraphrasing Peter Mair’s (2009) discussion of the evolution of PhD programmes in Europe over the last thirty years, this is no longer ‘the way we work’. Rather, our new programme has created a great framework for establishing and maintaining a lively and strong community among PhD students, clearly a major asset for the success of any programme, be this the MWP or any other PhD or post-doc programme. Mair, Peter (2009) The Way We Work Now. European Political Science 8: 143 – 150. People with a lower socioeconomic status are on average less healthy, and die earlier, than people with a higher socioeconomic status (SES). These health inequalities have been found in all countries with available data, and usually amount to between 5 and 10 years difference in life expectancy, and between 10 and 20 years difference in disability-free life expectancy. It is still highly debated whether causality goes from SES to health (social causation), from health to SES (social selection), or whether common background factors influence both SES and health (indirect selection). We try to find out how your socioeconomic status determines your health, how your health determines your socioeconomic status, which of these two processes is more important and what the role of common background factors is. Our project is funded by a Starting Grant from the European Research Council and studies the life courses of persons aged 50+, who were surveyed prospectively, and also retrospectively, for their entire life history, starting in childhood. We use information on periods and events of ill health, and periods and events of change in SES. By applying structural equation models the correlated processes of health deterioration (influenced by SES) and the development of SES (influenced by health) can be disentangled, taking into account endogeneity and confounders. We analyze complete records of life histories from the Survey of Health Aging and Retirement in Europe (SHARE) and the English Longitudinal Study of Ageing (ELSA). Life histories from childhood to old age represent a good time frame for disentangling causality between SES and health because confounding of the key variables prior to measurement is minimal. The project started in January 2013 and has a duration of four years (until January 2017). So far we have explored different statistical models that deal with longitudinal data and that could be used to answer different aspects of our research question; for example, a cross-lagged structural equation model and a latent growth model. Furthermore we have concentrated on some of the challenges and conceptual issues that are involved. For example, retrospective information concerning childhood conditions provided by elderly people can suffer from recall bias and we try to assess the magnitude of this bias. Second, it is still an open question as to which risk factor has a cumulative effect over an extended period, and for which risk factors there are distinct critical periods in the life course. Finally there are interesting differences between disciplines that have looked at this research question so far (mainly health economics and social epidemiology), both in terms of the preferred causal model and in terms of the best analytic strategy and design. While research on health is not very common at the EUI we have found it very helpful to discuss our work with people who work on social inequality and life course approaches, and especially helpful to be included in the Comparative Life Course and Inequality Research Centre (CLIC) at the SPS department. Eduwin Pakpahan, Hannes Kröger and I look forward to the years ahead. I have been awarded a two-year Marie Curie Intra-European Fellowship for Career Advancement to research EU lobbying across policy areas and lobbying venues, starting in September 2014. I will be conducting my research at University College London (UCL), in the Department of Political Science, where I will benefit from the mentorship and collaboration of Professor David Coen, a leading scholar in the field of European Union lobbying and interest groups and a former PhD graduate of the European University Institute. My research project aims to examine interest groups’ participation in European Union policymaking and to investigate a fundamental question regarding the EU interest representation system: under what conditions are interest groups’ policy demands integrated into the policymaking process and translated into policy outcomes? In other words, what factors explain interest groups’ success in influencing the content of EU legislative proposals? To answer this question my research will examine interest groups’ lobbying during the policy formulation and policy shaping stages of the EU policymaking process. In its first stage, my project will systematically examine interest groups’ demands, lobbying activities and demand attainment during the policy formulation stage, when interest organisations lobby the European Commission. In the second stage the analysis is taken one step further and will focus on examining interest groups and their lobbying activities during the policy shaping stage, when the legislative proposals put forward by the Commission are amended by the specialised committees of the European Parliament. My research will examine lobbying in four key EU policy areas: environment, economic and financial affairs, enterprise and consumers’ rights. To explain lobbying strategies and demand attainment I will develop and empirically test an explanatory framework that emphasizes the importance of the policy context in which lobbying takes place (Baumgartner and Leech 1998). My project proposes an innovative description of the policy context in terms of three key dimensions of EU policymaking: the policy space described by the characteristics of policy issues; the aggregate distribution of interest groups’ demands; and the inter-organisational environment described by the policy networks established between interest groups themselves and interest groups and policymakers. My research project addresses and contributes to the scholarship on EU lobbying, policymaking, policy networks and decision-making processes and outcomes. The project adopts an inter-disciplinary approach. By introducing policy networks as one key explanatory factor, the project brings a sociological perspective to the study of EU interest groups, which complements well the main theoretical approach of the project that emphasizes the importance of actors’ preferences, structural characteristics and resources, in line with mainstream political science research studying EU decision making based on the principles of rational choice theory and political economy. To explain the lobbying behaviour of EU interest groups the project will also draw theoretically on theories of organizational behaviour coming from the fields of public policy, business and organisational management. By conducting its empirical analyses with the help of statistical analyses, the project draws heavily on econometric techniques in order to identify causal relationships. Social networks analysis techniques will also be used to describe and empirically explore the characteristics and dynamics of policy networks. To explore in-depth the causal mechanisms lying behind these relationships, the project will use process tracing and analytical narrative approaches that are employed in qualitative research. This, in turn, indicates the multidisciplinary approach of the project. In honour of International Women’s Day, the Gender, Race and Sexuality Working Group, the History and Civilization Department, the Robert Schuman Centre and the Max Weber Programme came together to organize a half-day workshop on glass ceilings in academia, a thought-provoking topic that has appeared regularly in the press over the past decade. Professor Laura Lee Downs chaired the panels, which brought together specialist scholars from all over Europe, EUI professors, and Max Weber postdoctoral researchers, allowing for a rich and multi-faceted discussion. A number of disturbing statistics confirmed the workshop’s assumption regarding the seriousness of the problem: according to Paula Mählck (Stockholm University), women in Sweden – ‘the promised land of gender’ – make up 60% of the student body but occupy only 23% of professorial positions. Brenna Bhandar (SOAS) discussed similarly disconcerting statistics in the case of the UK, though Evi Pappa (EUI) reminded us that these statistics vary between nations. However, unpacking these figures and introducing new variables gave us a more nuanced idea of what exactly was happening. First, the under representation of women among the professoriate is closely correlated to the allocation of research funding: in Sweden, for example, 88% of research funding is awarded to men. Second, the voice of non-white women is often absent from these statistics. 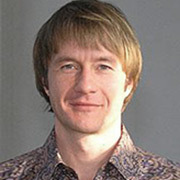 For example, the issue of race is not even acknowledged in Sweden – ‘We don’t need the word race in Sweden,’ Mählck stated. Yet, as Mählck and Bhandar demonstrated, themes of gender, race and research are deeply intertwined, and in order to understand glass ceilings in academia we must consider these together. But ‘glass ceilings’ are only one reflection of the problem of women in academia. Indeed, if there are glass ceilings at professorial level, many of us still have not yet – and may never – get through the door of academia. Although it is now commonly accepted that there is no significant statistical imbalance in the number of women in junior positions, Ludivine Broch reminded us that there are still many obstacles for young women aspiring to complete a doctorate or to obtain competitive early career positions. Rachel Applebaum gave a wonderful example of one of these big ‘obstacles’ women in junior positions currently face. She pointed out that the economic crisis has changed the nature of the job market. Since 2008, more young scholars have been forced to take a series of short-term jobs (including adjunct positions, Visiting Assistant Professorships, and post-docs) before they find tenure-track positions. This situation is particularly challenging for women with partners who also have careers/and/or children. It is often hard for their partners to find work in a new place for such a short period of time, and it can be a challenge to raise children far from the support networks that close friends and extended family can provide. So what can be done to help ‘crack’ the ceiling? Marieke van den Brinke (Radboud University) asked if transparency in the recruitment process could provide more places for women. Her results were not re-assuring: Brinke acknowledged that transparency is important and should be implemented, but she argued that it is not the complete answer. ‘Next to open recruitment,’ she stated, ‘people will always scout.’ And it is during this scouting and networking process that women are often excluded. Indeed recruiters, frequently male, scout candidates with perceived similarities; potential candidates with perceived dissimilarities are considered ‘risks’, and thereby excluded. Women, as such, are less often scouted, and the transparency during the actual recruitment process becomes redundant since the cards have already been played. Zoe Lefkofridi (Max Weber Fellow), whose own research intersects with the workshop, further commented on these ‘subconscious’ discriminations which women naturally fall victim to. She explained that, at every stage of their lives, women are undervalued in comparison to their male counterparts due to a subconscious stereotyping. Stereotyping is too obscure to clearly ‘fix’, but it remains one of the biggest stumbling blocks to women’s progression in professional (and personal) situations. But this very workshop underlined the absence of a general consensus amongst women themselves about experiences of glass ceilings in academia. Professor Evi Pappa (EUI) began her intervention with a highly controversial statement: she had ‘never felt that (she) had confronted a glass ceiling’. In economics, she stated, ‘we don’t look at gender, we don’t look at race’. But her subsequent remarks seemed to contradict this statement: she was one of five women in the Economics department of her old institution, a department which consisted of 45 people, and she is the only female Professor in her current Economics department at the EUI. In a response to Pappa, Professor Ruth Rubio Marin (EUI) finished the day with a reflective intervention about her own struggles with glass ceilings. Marin declared that ‘there is a glass ceiling’, and that she had experienced it herself. In a follow up to Applebaum’s earlier point, she argued that the absence of social and professional support made it much harder for women with families to take up professorial positions. And if women did take up those roles, they were given more to do than their male counterparts – from sitting on committees (since there always has to be one woman) to giving students pastoral care and advice. A new set of norms, which were never there before, fundraising for research, for instance, also makes it much harder for women to succeed in the market-economy academic system. Marin’s intervention resonated strongly throughout the audience, giving both insight and hope for the future. As the Q&A discussion revealed, the creation of alliances amongst women, to enhance our environment, can slowly shift a conservative, male-dominated system. Indeed, throughout the day participants, commentators and audience members made suggestions to help budge the (in)visible forces which uphold glass ceilings: increased visibility, not least for racial minorities and especially women of colour; shifting emphasis from certain research areas to others; creating stronger support systems and training schemes for female doctoral and postdoctoral researchers; financial aid for those relocating with children and families. This seriously challenges the argument that women need to be ‘more aggressive’, to ‘keep on fighting’, to ‘lean in’, an argument which essentially encourages women to adopt more ‘masculine’ traits and fit a model built by and for men. Indeed, the future should not be framed in those terms, and there is much hope that women will take an active part in re-shaping the old models to build new moulds and structures. Women in Academia : what does it take to reach the top ?’, The Guardian, 24 February 2014 ; ‘Women at Google Looking Past the Glass Ceiling,’ The New York Times, 23 August 2013 ; ‘Economists confirm existence of glass ceiling for women in academia’, Times Higher Education, 27 March 2008 ; ‘Women crack glass ceiling,’ Times Higher Education, 25 June 2004 ; ‘The Glass Ceiling in Academic Life,’ The New York Times, 8 July 2002. Academics can make a special contribution to the alleviation of severe poverty. Their expert knowledge, their skills as teachers, their ability to critically analyze political debate as well as their privileged social standing allow them to have a significant impact on some of the most pressing global issues of our time. Academics Stand Against Poverty (ASAP) is a rapidly growing professional association that aims to have such an impact on policy debates related to global poverty. Over recent years, several national and regional chapters of ASAP have been created in Australia, Austria, Brazil, Canada, Great Britain, India, Italy, Mexico, Norway, Oceania, the United States and West Africa. In those places, ASAP now has hundreds of members and includes several student associations. Guided by a distinguished advisory Board that features some of the most prominent thinkers on poverty and development, ASAP is led by an interdisciplinary team of scholars and students from around the world. ASAP wants to bring together scholars working on poverty related issues in universities, think tanks, NGOs and the public sector. Beyond establishing a network of scholars, ASAP wants to facilitate the translation of empirical and normative research on global justice and global governance into practical interventions into public debate and policy discourse. ASAP does this by engaging in several “intervention projects”. The most ambitious of these intervention projects is the Institutional Reform Goals project, which aims to develop a set of politically feasible development goals that go beyond the current “wish-list” of the Millennium Development Goals. ASAP’s focus is on the responsibilities of affluent states ‒ not just on outcomes for recipients of international aid. Several policy areas for research and advocacy have been prioritized so far, among them Health; Financial Transparency and Integrity (Illicit Financial Flows); and Participatory and Inclusive Development Decision-making. Take the Illicit Financial Flows project for example: in 2011 alone, the astounding amount of USD$ 950 billion has been spirited out of developing countries through smuggling, money laundering, corruption, and corporate tax evasion, arguably aided by current supranational institutional arrangements. The IFF project attempts to formulate policy targets of financial transparency as part of the post-MDG framework. In January 2014, the German chapter of Academics Stand Against Poverty (ASAP Deutschland) was founded in Berlin during a high-profile public launch conference titled “The Structural Roots of Global Poverty: Analysis, Critique, Reforms” at the Freie Universität Berlin. There were panels on illicit financial flows, on social security as a new paradigm in development policy, and on corporate and investment ethics. 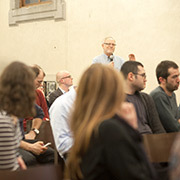 The conference brought together scholars from various disciplines, as well as from the public sector, aid organizations, policy analysts and politicians. At the end of the conference, ASAP Deutschland was formally constituted. 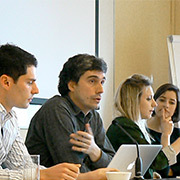 Several different and very diverse working groups were established (ranging from a critical development economics reading group to a group specializing in illicit financial flows, to a project group that wants to establish a one-to-one partnership programme between poverty scholars of the Global South and the Global North). We always welcome volunteers and new members that strive to make academia’s contributions to poverty alleviation more effective. If you would like to collaborate within the global organization or individual country chapters, let us know. Robert Lepenies, Max Weber Postdoctoral Fellow in LAW, is on the Steering Committee of ASAP Deutschland, co-organized its launch conference and is the coordinator of the Global Colleagues Programme. There is growing public, policy and scholarly interest surrounding the use of neuroscience ‒ and in particular, of brain imaging ‒ as evidence in Court, especially in the United States and European Union countries. Brain imaging can be used, and has been used for a long time, to prove head and brain injury, but only recently has it begun to be used as evidence of psychiatric conditions. In tort cases, brain imaging can serve as proof that psychological harm has been inflicted on the claimant: post-traumatic stress disorder syndrome is an example. In criminal trials, brain imaging is being used to prove the existence of conditions potentially affecting competency. While prominent legal experts, among them Stephen J. Morse, Upenn, and neuroscientists recommend caution, data show an increase in the number of defendants that request the admission of brain imaging evidence to purport the insanity defence. An advisory team to President Obama, consisting of prominent experts and led by Nita A. Faharany, Duke, recently examined over 1,500 judicial opinions, issued between 2005 and 2011. The number of opinions making reference to brain imaging rose from roughly 100 to about 300 a year over the seven-year survey. Some defendants escaped death sentences on the basis of brain imaging evidence, others complained of poor legal assistance when their lawyers failed to have them tested for brain abnormalities. No such data are available for EU countries at the present time. 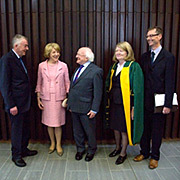 However, the issue is very topical and Dutch and British governments have made concrete steps toward collecting systematic information on the use of neuroscientific evidence in their respective courts of law; a number of recent Italian cases where neuroscience was used ‒ homicide cases and one of paedophilia) attracted considerable media attention and major comparative scholarly works on the use of brain science in European courts have started to appear. Following my two-year Max Weber Fellowship, I am now a Research Associate at the EUI, in the framework of Dennis Patterson’s “The Guilty Mind” NeuroLaw project, a multidisciplinary study of the use of brain imaging evidence in the criminal courts of various European countries. 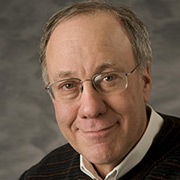 Legal expert and philosopher Patterson (Rutgers University and EUI) is the author of several works on fundamental questions in Law & Neuroscience, including the very recent Minds, Brains, and Law, co-authored with Michael Pardo (Oxford University Press, 2013). These thematic groups were arrived at inductively, on the basis of the research proposals of the candidates selected. As a result, the themes are likely to change each year and applicants should not regard their fit or lack of fit with a current theme as having any bearing on their suitability for the Programme. For a detailed description of the this year Research Themes please go to the MWP website. Max Weber was born 150 years ago, on 21 April 1864. To mark his anniversary, the Max Weber Programme will start the new season of MW Lectures on 15 October 2014 with a special Max Weber Lecture by Peter Ghosh of the University of Oxford, the author of a recent definitive study of Weber’s The Protestant Ethic and the Spirit of Capitalism. Find the full list of MW Lecturers for 2014-2015 on the MWP website. The next call for the MWP Fellowships is in preparation. Please check the News section on our homepage for the announcement of the open call in the near future. The MWP is planning to become a platform for the broader MWP community to share their academic life. Fellows, both former and current, are warmly invited to use the MWP blog and the Programme Facebook page to publicise their projects, ideas, conferences and workshops and to engage with their colleagues. Please send items for posting on line to valeria.pizzini@eui.eu. The June conference brings together past and present Fellows. 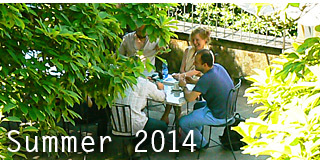 This year, from 11 to 13 June 2014, the Max Weber Programme brings Fellows together in the Badia for the first time. The conference is intended to provide a perspective of the Max Weber Fellows' contributions to the Social Sciences and Humanities in research and academia. It will also be a forum to foster cross-disciplinary and inter-cohort academic collaboration. 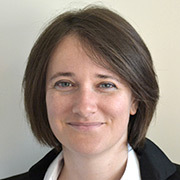 Sarah Soule, Stanford University, will deliver the keynote lecture, titled ‘Protest Event Data: New Techniques for a Time-Honoured Data Source’, on 11 June, 17:00-19:00, in the Refettorio. The Nobel Prize laureate Roger Meyerson, Professor of Economics at the University of Chicago, will deliver the last MW Lecture of this academic year on 18 June 2014, 17:00-18:30, in the Refettorio at the Badia. The lecture will consider the effect of information economics on macroeconomic theory. Before the development of information economics in the 1970s, there was no microeconomics of banking on which macroeconomic theory could be based. Moral-hazard agency theory and the economics of information can provide the basis for a better understanding of macroeconomic instability. Credit rationing and debt leverage constraints can be derived from moral hazard in entrepreneurship and financial intermediation. However, uninformed investors' concerns about adverse selection can make debt financing more attractive to entrepreneurs and financial intermediaries, up to these moral-hazard leverage constraints. Long-term incentive contracts that efficiently solve moral hazard problems, with limited liability, should be recognized as a factor which by itself can cause the economy to be dynamically unstable. Such agency problems can offer a basis for debt-deflation or balance-sheet theories of recessions, with fundamental implications for macroeconomic stabilization policy. All welcome but please register for this event. 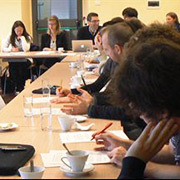 On 26 February the Academic Careers Observatory (ACO) organized its 2nd annual conference on funding opportunities for young and mid-career scholars. In order to prepare the Max Weber Fellows (MWF) for this event, ACO held an informal workshop on 5 February. The main purpose of this workshop was to provide the MWFs with some useful insights into European funding opportunities in particular. Special attention was given to topics such as Horizon 2020 and its impact on European funding schemes for early-career Fellows; applying for Marie Curie Individual Fellowships and European Research Council (ERC) Starting Grants; host institution support; and the application review process. Participants in this workshop were all from the EUI and included Ingo Linsenmann (Robert Schuman Centre for Advance Studies – RSCAS), Andrea Calderaro (RSCAS), Rasmus Hofmann (Social and Political Science Department, ERC Starting Grant) and Adriana Bunea (MWF, Marie Curie Fellowship winner). 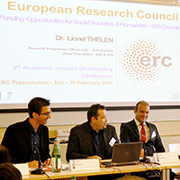 At the conference, which took place several weeks later, representatives from both European and national agencies provided an overview of the available research and funding schemes for young and mid-career scholars in the Social Sciences and Humanities (SSH). The conference was split into three consecutive panels. In the first morning panel, Lionel Thelen, from the European Research Council (ERC), and Fabio Biagioni, from the European Commission (EC), talked about the funding schemes offered by European agencies. Thelen focused his talk on the applications procedure and eligibility requirements for different types of ERC grants (Starting, Consolidated and Advanced). Biagioni presented Marie Sklodowska-Curie Actions and explained some of the major changes in the EC’s funding schemes in the context of the EU’s new Framework Programme for Research and Innovation – Horizon 2020. Moving the focus to the national agencies, the second panel hosted representatives from the United Kingdom, Ireland, Poland and France. Dora Meredith, from the UK’s Economic and Social Research Council, and Eavan O’Brien, from the Irish Research Council, presented the funding schemes of their respective agencies, while Julia Zimmerman, from the Foundation for Polish Science, and Pierre-Olivier Pin, from the French National Research Agency, explained the range of funding opportunities in the Polish and French national context. The third panel continued with the presentations of the national agencies. Eckard Kämper from the German Research Foundation explained the broad range of funding schemes that aim to attract young and talented researchers to Germany. Martina Haug followed up, explaining different funding schemes offered by the Swiss National Science Foundation, while Clara Eugenia Garcia from the Spanish Ministry for Economic Affairs and Competitiveness talked about the funding opportunities for postdoctoral researchers in Spain. Finally, Petra Grabner from the Austrian Science Fund offered an overview of the main funding opportunities for SSH scholars interested in conducting their research in this country. After the plenary session that concluded the conference, MWF and EUI researchers interested in the funding opportunities in a particular country had a chance to take part in individual tutorials and ask agencies’ representatives more specific questions. For an overview of the conference programme and speakers’ presentations link to the ACO website. What are our different methodological approaches to understanding wars, war crimes and their consequences? Do these consequences change in time and space, or can we discern patterns? Whilst many of us are aware of the visible and immediate consequences of wars and war crimes, what about the slower shifts we can discern? What of the total absence of consequence in view of wars and war crimes? How politicised do these consequences become? Are they imposed from the highest ranks in society, or are they brought about by more grass-roots phenomena? On 30 April 2014 the LAW Academic Practice Group invited Tim Thompson (Partner, Deloitte, UK), Ignacio Tirado (University of Madrid/Worldbank), Adrienne Heritier (EUI) and Youssef Cassis (EUI) to hold a multidisciplinary workshop. The aim of the workshop was to shed greater light on the likely consequences and possible disputes between member states that the new European regulatory and supervisory authorities could bring. The European System of Financial Supervision (ESFS) was implemented as the institutional framework of European financial supervision was trying to regain and ensure financial stability in achieving the common internal market. The European Supervisory Authorities (ESAs), constituting the European Banking Authority (EBA), the European Insurance and Occupational Pensions Authority (EIOPA) and a European Securities and Markets Authority (ESMA) were given the authority to converge the different supervisory and regulatory approaches to financial institutions of the EU member states. The European Systemic Risk Board (ESRB), under the responsibility of the European Central Bank (ECB), complements the framework. The framework was further developed with the Single Supervisory Mechanism (SSM), whereas the ECB assumes responsibility for specific supervisory and regulatory tasks for SIFIs in the EU to establish an integrated banking union with a ‘single rulebook in the form of capital requirements,...harmonised deposit protection schemes...and a single European recovery and resolution framework.’ The transfer of member states' competence and discretion in supervising and regulating financial institutions to a European Authority could be problematic, not only in legal terms but also politically. The supervisory and regulatory activity of the EU in harmonising national laws and limiting fragmentation of financial markets could expose a further risk, deepening the Eurozone crisis even more if the new regulatory structure is not flexible enough to adapt and implement economic policy measures to the constantly changing environment. On 11 April 2014 the annual MWP-JMU graduate symposium addressed the theme ‘The European Union and the Challenges of Globalizing Politics and Economics’. The Keynote Lecture ‘Citizenship with a Price Tag?’ was delivered by Jelena Dzankic, Marie Curie Fellow, European University Institute. Please find the full programme of the symposium on the MWP website. The 8th MWP Classics Revisited Conference this year focused on Adam Smith. It was held on 7 May 2014 at Villa la Fonte, to add a little bit of nostalgia to the MWP activities. 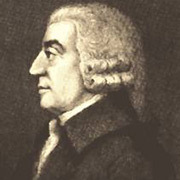 As well as taking on the perennial question of the compatibility between Smith’s moral and economic ideas, the conference considered Smith’s standing in relation to current economic thought. The Wealth of Nations is sometimes described as the first systematic attempt to explain the mechanics of capitalism, but how closely does it fit in with modern theories of economic behaviour? Are the specific benefits from trade and competition that Smith envisaged compatible with today’s models? More broadly, could today’s economists benefit from paying closer attention to moral sentiments beyond self-­interest? The Keynote talk ‘Adam Smith for a Global Age’ was delivered by Fonna Forman, UC San Diego. The Conference was organized by Charles Brendon (ECO), Pablo Kalmanovitz (LAW), Robert Lepenies (LAW), Magdalena Malecka (LAW), Matthew Hoye (HEC), Valerie McGuire (HEC), Fran Meissner (SPS), Brandon Restrepo (ECO), Micahel Rousakis (ECO), Jasper Rudiger (ECO). Please find the full programme of the conference on the MWP website. On the 19 March 2014 Mary Nolan, NYU, delivered a MW Lecture on human rights and market fundamentalism in the United States, Europe and Latin America. These were simultaneously discourses, ideologies, national movements and transnational networks, and policies that states and NGOs sought to impose. Human rights and market fundamentalism both claimed universal applicability and dismissed previous ideologies; they adhered to methodological individualism, critiqued the state, and marginalized the social. But despite striking affinities, there is no single relationship between human rights and market fundamentalism from the 1970s through the 1990s. The relationship of human rights and market fundamentalism depended on the region and policy in question, as well as on Cold War understandings, priorities, and anxieties. Whatever degree and type of entanglement, the dominant understandings of human rights from the 1970s to the 1990s encouraged governments, NGOs, and international organizations to focus on the individual, the legal and the political, and to ignore how neoliberal structural adjustment violated the economic and social human rights of so many. 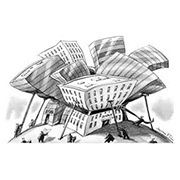 Market fundamentalism, in turn, encouraged governments to envision nation building in neoliberal terms, and development economists to promote neoliberal models. It provided the human rights movement with a further rationale for ignoring collective and economic rights. 1. When thinking about the relevance of what they do, most political scientists think about being advisors either to the political elites or to inform the general public. These are aspects of relevance with limited importance. 2. Most political scientists are uninterested in explaining what the “political machine” (that is, the State) can do for improving human well-being, broadly defined. 3. Most political scientists, especially the American branch, have, for ideological reasons, concentrated their thinking about the state on how to tame and limit its power and therefore have been less interested in issues about states’ administrative capacity. 4. Most political scientists take for granted that democracy is the main source of political legitimacy, which seems not to be the case. 5. Issues of ‘bad governance’, especially corruption in public administration, have largely been ignored by political scientists. 6. The detrimental effects of ‘bad governance’ upon political legitimacy, prosperity and human well-being, are mostly unknown and ignored by political scientists. 7. Normative efforts in political theory about how to increase social justice have ignored problems about implementation and governance that are empirically and theoretically well established. Stanley Fish, Florida International University, delivered a MW Lecture on 21 May 2014. The lecture began by observing that very different notions of academic freedom emerge, depending on whether the word ‘academic’ is understood strongly. If it is, the freedom academics can claim is limited to the core duties they perform in accordance with a contractual or quasi-contractual understanding of the academic task. In most cases this will mean teaching and/or research activities. So limited, academic freedom is a professional privilege that follows from the unique nature of the academic job – the advancement of truth by means of disinterested techniques of investigation and inquiry. Academics do not enjoy that privilege if they are engaged in other activities, even if they take place in a university setting. A more expansive notion of academic freedom will follow from an emphasis on the word ‘freedom.’ If academic freedom is thought to be either a subset of the doctrine of freedom of speech, or of the general imperative to advance the cause of freedom, academics will conceive themselves as free to use their positions in an effort to further the causes – usually political – they are committed to. It is this expansive notion of academic freedom that leads, for example, to the academic boycott of Israeli universities. Those who favour the boycott resist the accusation that it violates academic freedom and argue instead that a proper understanding of academic freedom requires the boycott. Fish contended that one moves from a severely professional definition of academic freedom to a more global definition in five stages, which he calls the five schools of academic freedom. A description and assessment of those schools was at the heart of the lecture. Ilenia Brilli, ECO Fellow 2013-2015, has been awarded the Italian Economics Association’s prize for the best PhD thesis for her dissertation, ‘Child development and cognitive outcomes: The role of public and family inputs’. The Prize aims to promote the work of young economists. Adriana Bunea, SPS Fellow 2013-2014, has been awarded a Marie Curie Intra European Grant for Career Advancement for two years for the research project, ‘Interests, demands and network ties in Brussels: explaining interest groups' lobbying success across EU policy areas’. Adriana’s host institution will be University College London, Department of Political Science, and her mentor will be Professor David Coen. 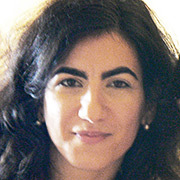 Sheila Cristina Neder Cerezetti, LAW Fellow 2011-2012 has been granted an Alexander von Humboldt Research Fellowship. 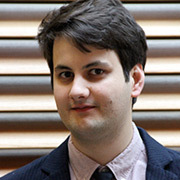 David Do Paço, HEC Fellow 2013-2014, has been awarded the Gabriel Monod Grant from the Institut Français d’Histoire en Allemagne, for his project ‘Clientelism and radical reforms between Empires: the private correspondence of Philipp Cobenzl and Peter Herbert (1779-1792)’. Nathan Marcus, ECO Fellow 2011-12, has been awarded a grant from the Institute for New Economic Thinking (INET), funded by George Soros, to pursue his postdoctoral project. Can Aybek, SPS Fellow 2008-2009, has been appointed professor of empirical social research at the Faculty for Social Sciences of the University of Applied Sciences Bremen (Hochschule Bremen), Germany. 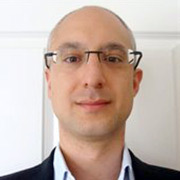 Stelios Bekiros, ECO Fellow 2008-2009, has been appointed Research Professor at IPAG Business School, Paris, France. We are glad to receive and announce former and current MW Fellows’ publications. This is a selection of publications received in 2014. Tomas Dumbrovsky, LAW Fellow 2012-2013, (with Petkova, B., van Der Sluijs, M.), ‘Judicial Appointments: The article 255 TFEU Advisory Panel and selection procedures in the Member States’, Common Market Law Review, Vol. 51, No. 2, pp. 455-482, 2014. 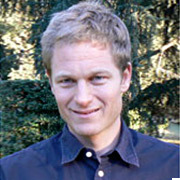 Rasmus Hoffmann, SPS Fellow 2008-2009, (et alii. ), ‘Social differences in avoidable mortality between small areas of 15 European cities: an ecological study’. International Journal of Health Geographics 2014 13:8. doi:10.1186/1476-072X-13-8. Sarolta Laczó, ECO Fellow 2009-2010, ‘Risk Sharing with Limited Commitment and Preference Heterogeneity: Structural Estimation and Testing,’ Journal of the European Economic Association, forthcoming. Stéphanie Novak, SPS Fellow 2010-11, ‘Le Grande Retour des États?’ in Yves Mény and Sabine Saurugger, La Gouvernance européenne revisitée, special issue of Pouvoirs, 149, Paris: Le Seuil. Eugenia Vella, ECO Fellow 2013-2014, (with E. Dioikitopoulos and S. Kalyvitis) ‘Green Spending Reforms, Growth and Welfare with Endogenous Subjective Discounting’, forthcoming in Macroeconomic Dynamics.